These 5 ingredient homemade snickers bites are a simple indulgent snack that you are going to love to have on hand at all times! 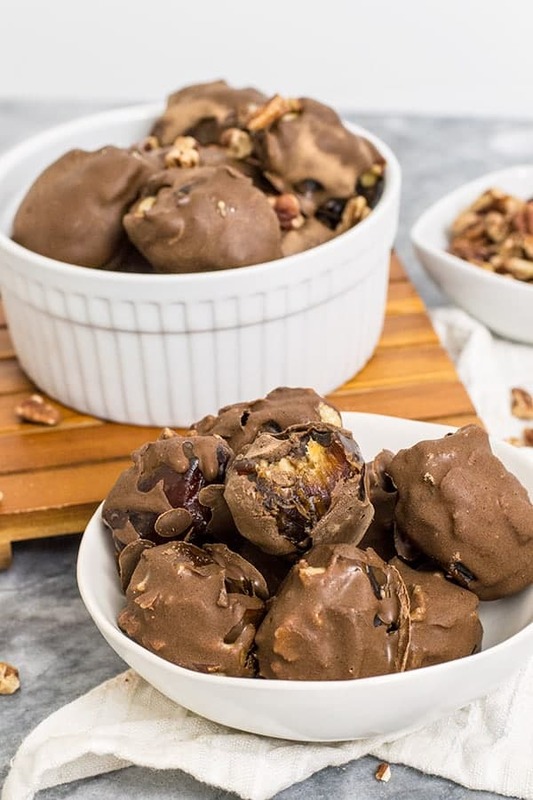 These bites are vegan, gluten free, dairy free, paleo and so simple to make, you only need 5 ingredients! When I was working in corporate accounting, we had a community candy drawer that I swear I couldn’t walk past without stopping “just for a look” at least once a day. I would always grab a few of my favorite mini chocolate candies, vowing to “stash them away for a rainy day” anytime I saw them in the drawer. Some of my favorites were the mini Snickers and the mini Almond Joy’s. To be 100% honest, usually these chocolate bars didn’t make it to my desk, as they were quickly devoured by me the minute they were in my hand. It was a nasty cycle to say the least! At some point I had to quit cold turkey. I found out I was just not good at moderation and by not opening the drawer, it was much easier for me to say no. This is also why I don’t buy Halloween candy. Even though I don’t crave it, just having it in the house is a temptation I don’t need on a daily basis. However, I still like to have indulgences. 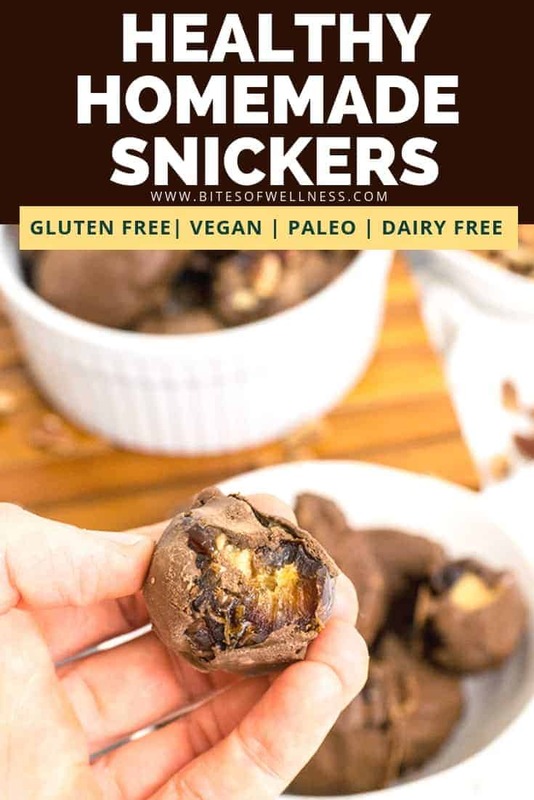 I try to make better for you versions like these 5 ingredient homemade snickers bites. 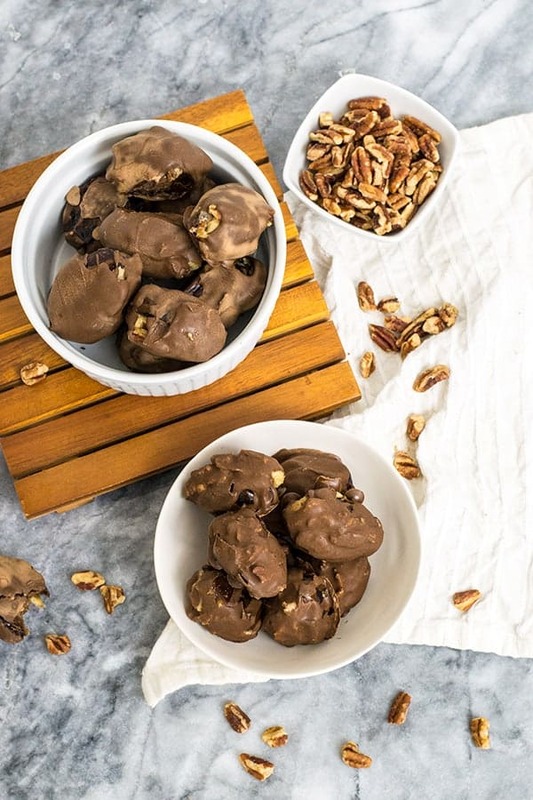 The ingredients are simple: dates, tahini, maple syrup, pecans and dairy free chocolate chips. No artificial colors or ingredients, no high fructose corn syrup or potential gluten, peanut or dairy cross contamination, which is important in our house! By the way you could also make your own chocolate coating with protein powder and coconut oil if you want! Check out the instructions for how to make that in my homemade almond joy post! My go-to brand of dairy free chocolate chips is the Enjoy Life Brand, but Lily’s brand is also a great option! 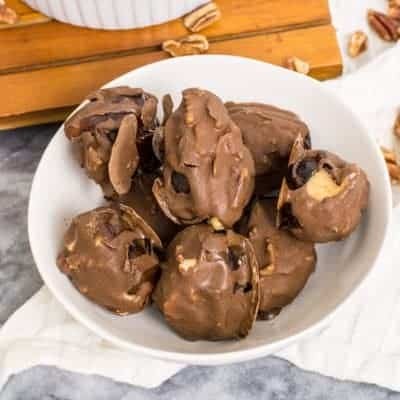 You could also cut up your favorite dark chocolate bar and melt that for the chocolate coating as well, you don’t have to just use chocolate chips! Also, you can cut the chocolate in half and just drizzle the dates instead of cover them if you want to save the calories and added sugar! You will never buy store bought snickers again! 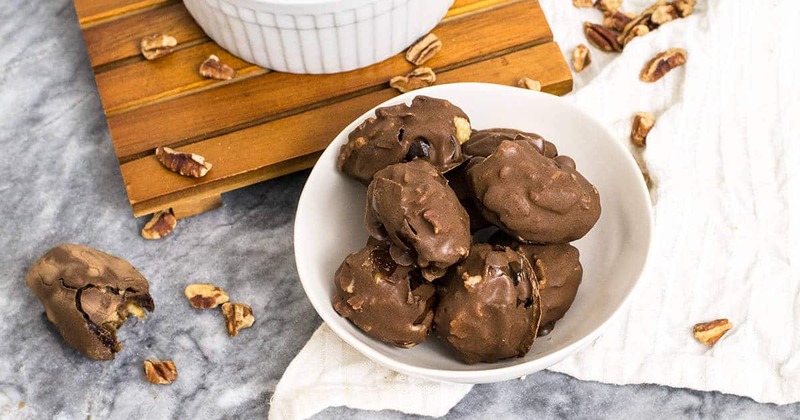 These 5 ingredient homemade snickers bites are a healthy indulgence! Vegan, dairy free, gluten free, allergy friendly and paleo! Remove the pits from the dates by cutting one side from top to bottom and removing the pit. Place a sheet of wax paper or silicone liner down for the candies to rest on once they are coated in chocolate. Melt the dairy free dark chocolate chips in the microwave for 1 minute. Stir well until fully melted. 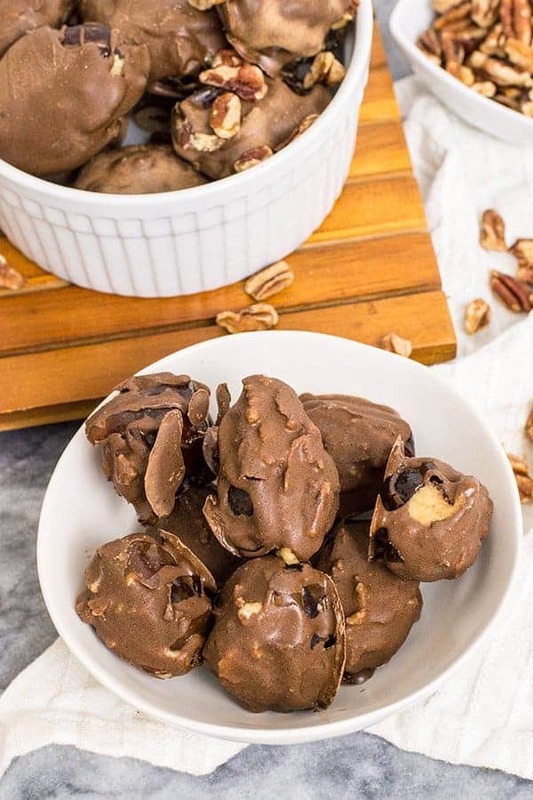 Using a spoon, drizzle the chocolate over the frozen dates and place on the wax paper. Place the chocolate covered dates in the freezer until the chocolate hardens. You can store in the freezer or transfer to the fridge. What is your favorite candy treat? Do you love stuffed dates? Add pecan to the date? Do you mean put it inside the date, along with the nut butter? Yes, Dawn you’ve got it! If you don’t like pecans you can omit! These are so amazing AND so simple…LOVE! I’ve shared with friends and they very much enjoyed. Thank you for sharing your recipe!! btw, Snickers were one of my most favorite candies and now I can satisfy that urge? I just made these this evening and woahhh YUM! I don’t know that they count as health food… but there are certainly worse options, right?! I am 100% convinced that eating a ridiculous amount of dates toward the end of my last two pregnancies sped up my labor and improved ease of delivery (my last kid was 9lbs but came after only 3 hours start to finish – and I am NOT a large person!). 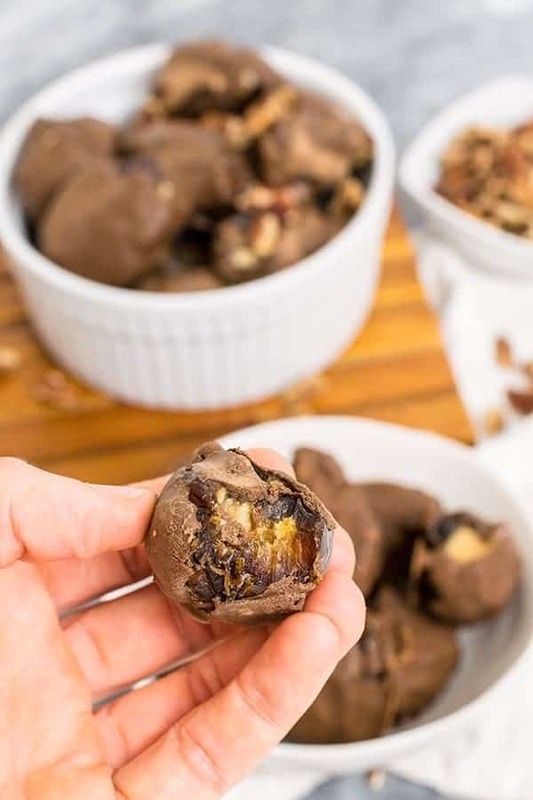 I wish I would have had this recipe a few months ago because this was way better than adding straight dates to my oatmeal or consuming a ton of expensive Lara bars! These sound so good! Our favorites are chocolate covered cherries, and truffles. But, that wouldn’t stop us from trying your recipe. Thanks for sharing at the Inspiration Spotlight party. Pinned & sharing.